The food & beverage industry will not remain a safe haven against the current wave of digital disruption. Classical players in food retail will need to move quickly to adopt a seamless omnichannel approach. This means stepping up their growth in e-commerce, covering the last mile with pick-up centers and home delivery. On top of that, they need to invest in their stores, upgrading the shopper experience and installing new tech solutions to improve shopping convenience (e.g cashier-free shopping). The funding of these investments will need to come from additional trade margin, given the thin profit margins in the industry. Pressure on trade terms, combined with channel changes towards pure players (such as Amazon and Alibaba) and new business models will cause a major disruption for food manufacturers. On top of facing a total war across the value chain, the food & beverage industry will need to surf on the key trends. The consumers are becoming more and more demanding and unpredictable. Those branded manufacturers that are not able to become data-enabled or experience rich will not be able to survive. This strategy paper will explore the 9 key trends and will give inspiration for possible solutions to become more future-proof. Below, a brief overview of the trends that we see. To read those in detail, download the whitepaper at the bottom of the page. 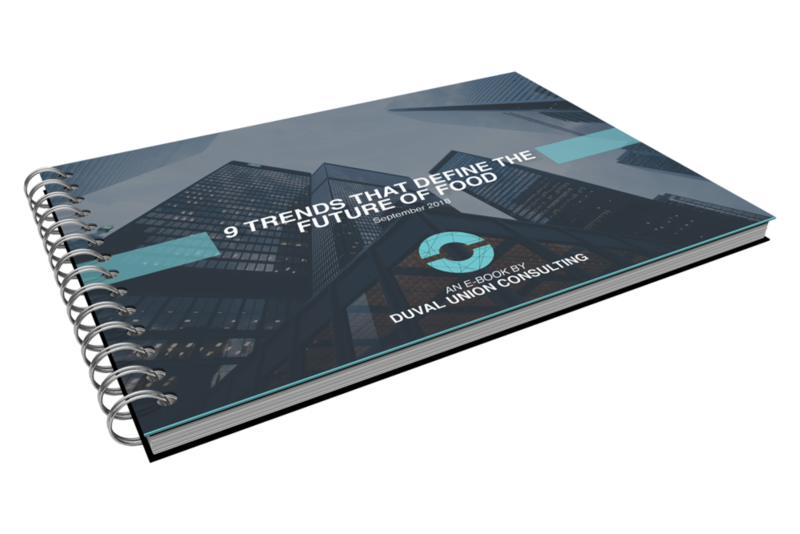 This form collects information we will use to send you the 'whitepaper 9 trends that define the future of food' and other food and beverage related content. We will not share or sell your personal information. You can unsubscribe at any time. Thank you! You’ll receive the whitepaper in your inbox. Are you able to become future-proof? We’re here to help.